Honeywell’s eZtrend is a cost-effective, general purpose DIN size electronic data recorder that easily replaces 100 mm paper strip chart recorders, providing the ability to capture continuous and batch data electronically. Data is recorded in a secure digital format, eliminating interpolation errors that can arise from transposing data from a chart to a spreadsheet for analysis. The eZtrend paperless recorder reliably records electronic data in a secure format from directly connected sensors or transmitters that can be used for documentation of the process conditions and process improvement. 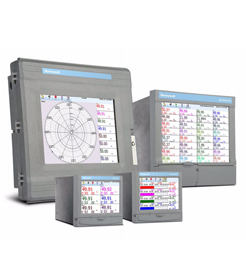 Its 5.7” color active TFT type display provides clear, easy viewing of the process data over traditional 100 mm paper recorders and many other entry-level paperless recorders. It supports up to 12 directly connected analog inputs that handle T/C, RTD and Linear input sensor types. The recorder stores data to a 1 GB internal non-volatile memory which can be expanded to 2 GB. The eZtrend creates encrypted data files that can only be read and analyzed using the TrendManager Pro software tools to ensure data integrity.